Afternoon Repose shows a gorgeous garden scene filled with flowers. There is a beautiful atmosphere of overcast sky which provides a suggestion of a cool climate, as the sun streams through the clouds to illuminate the scene. Pink flowers on vines decorate the columns and a variety of flowers are on the entire garden. The path leads the eye towards the gate which leads to the scene beyond. 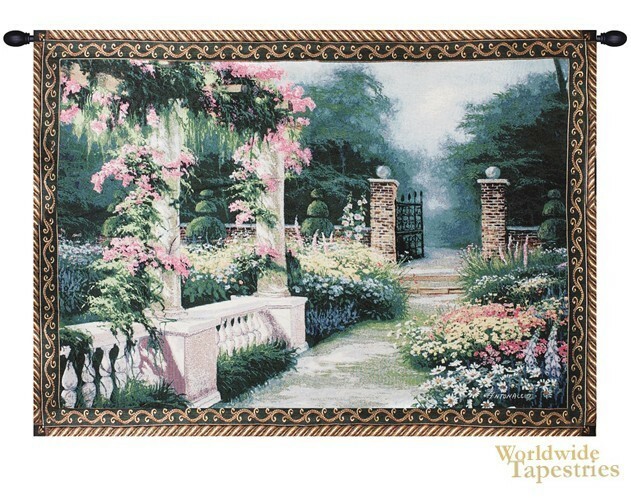 This Afternoon Repose tapestry is backed with lining and tunnel for easy hanging. Note: tapestry rod and tassels, where pictured, are purchased separately.